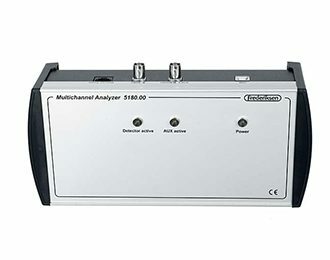 A multi-channel analyzer (MCA) sorts incoming pulses from an energy-sensitive detector (scintillation detector) into a large number of channels according to size. When the counts in the channels are plotted as a function of the channel number, the result is an energy spectrum. 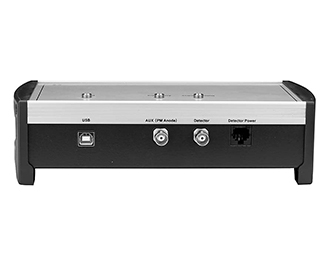 This MCA features 1024 channels, variable analog and digital gain. a variable integration time, and built-in logic to reject “pile up” (a pulse starting on top of the previous one). 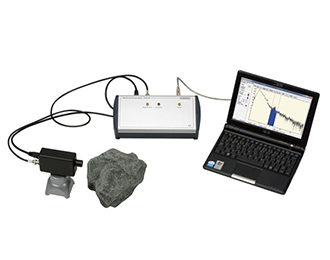 The MCA and accompanying software have been specifically developed to work with the Scintillation Detector (SF-7223), but an “AUX” input can be used with the anode signal from a traditional photomultiplier tube. The MCA is powered through a USB connection. When the MCA is connected to a computer, the included user-friendly software can initiate data acquisition at the press of a button. In the spectrum, one or more energy ranges can be defined where the counts can be summed. Default settings for CsI(Tl) and NaI(Tl) scintillation detectors can be retrieved with a a single button push. In the spectrum, one or more energy ranges can be defined where the counts can be summed. Also, the data can be fitted to a Gaussian function. Decay of the counts into a Gaussian peak(or simply into a channel range) can be fitted to an exponential decay function.